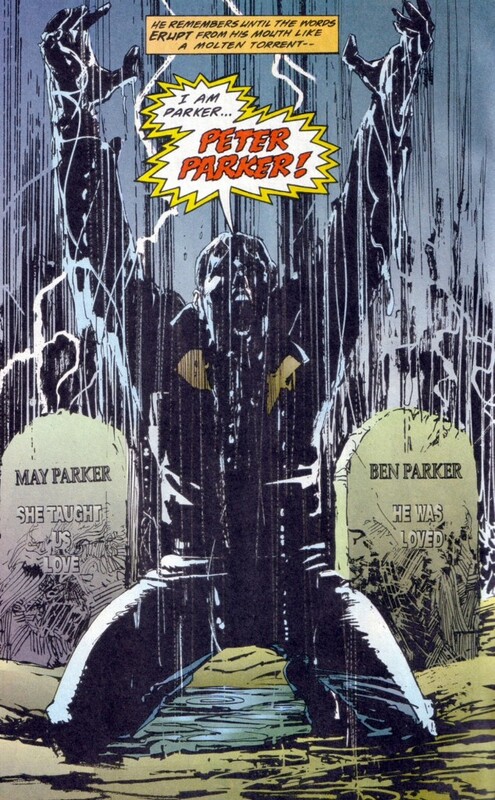 It’s completely emblematic that in the midst of one of the most controversial periods for Spider-Man comics in the character’s history, Marvel would deliver a surefire classic in Amazing Spider-Man #400, and then follow-up that beautiful and tender story with the two-part “Aftershocks” (Spider-Man #57 and Spectacular Spider-Man #223) – an arc that seems to advocate transforming Peter Parker into the 1990s version of the Walking Dead’s Rick Grimes by piling the adversity on him to the point of snuff filme-esque torture. In my last Clone Saga Callback entry, I mentioned that the preceding “Players and Pawns” storyline marked the beginning of the steep precipitous decline that defines the “Clone Saga” 20 years later. Well, unless you think framing Peter Parker for a murder committed by one of his evil clones; hinting that Mary Jane’s in utero child might have an abnormality from Peter’s radioactive blood; and further hinting that there’s a third Peter walking around who is the genuine article is the mark of good storytelling, then you could say that “Aftershocks” was a sign that the “Clone Saga” had officially entered its silly season. The fact that Spider-Man #57 kicks off mere moments after ASM #400 ends feels more like a smack in the face to the reader than anything else. The Spider-Man brain trust makes a point about the fact that Peter’s arrest for multiple murders he committed in New York and Utah doesn’t even allow him appropriate time to grieve the death of the last bit of family he has. But they also fail to take into account that the readers themselves might still be reeling emotionally from the loss of May. 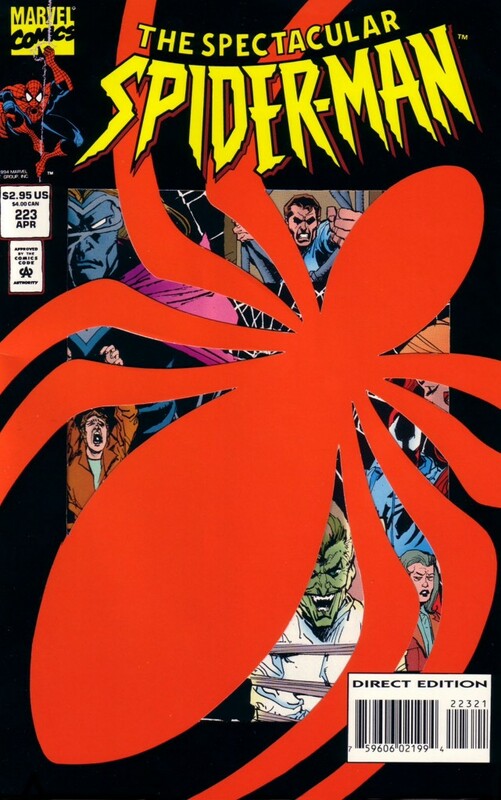 And yes, this is superhero comics after all – get over it – but even after 20 years of hindsight, the opening scene of Spider-Man #57 reads just as callous and tone deaf as it did when I first picked up the comic in 1995. You’re telling me there was no other way to ease into this story? And that’s to say that this is a story that the creators should have been telling in the first place. 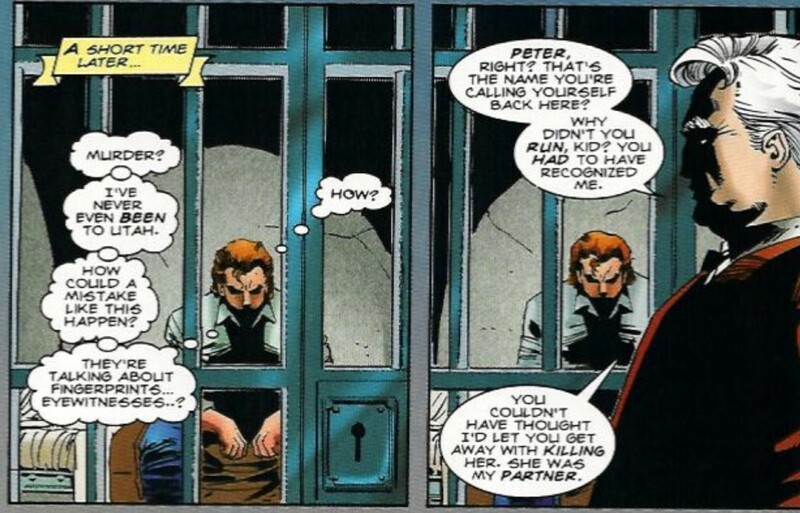 I don’t know why I think Peter getting accused of a bunch of murders perpetrated by Kaine is so bothersome and offensive, but “Aftershocks” and the following two arcs, “The Mark of Kaine” and “The Trial of Peter Parker” feel like pure 90s shock value for shock value sake. Only a few storylines earlier, the braintrust had introduced the idea that perhaps the Peter we had been following the past decade or so wasn’t actually the original Peter Parker. That alone is an interesting enough premise to carry a comprehensive storyline to fruition. But instead the creative team kept fluffing it up, putting so many shades of lipstick on a pig it became unrecognizable. 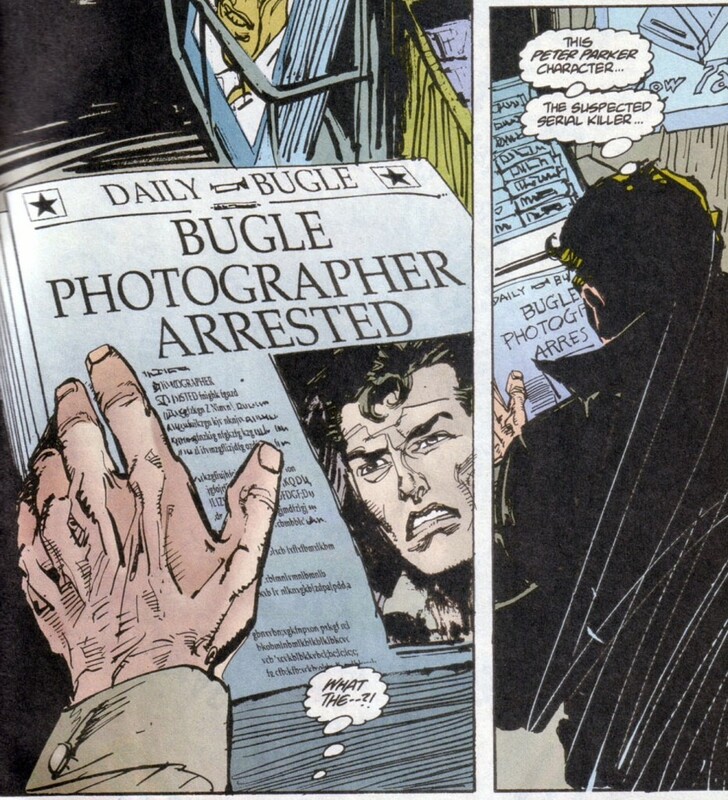 An arrest and trial storyline only served as a diversion from some of the revelations made (for better or worse) in “Maximum Clonage.” It’s just another emotional obstacle for Peter to overcome during a period where Marvel and DC were both hellbent on breaking down all of their core characters and attempting to rebuild them into a lineup of edgy and hardened heroes. I know, I know, it’s just a token comic book trial/frame-up story. Calm the heck down Ginocchio. It’s been done countless times over. 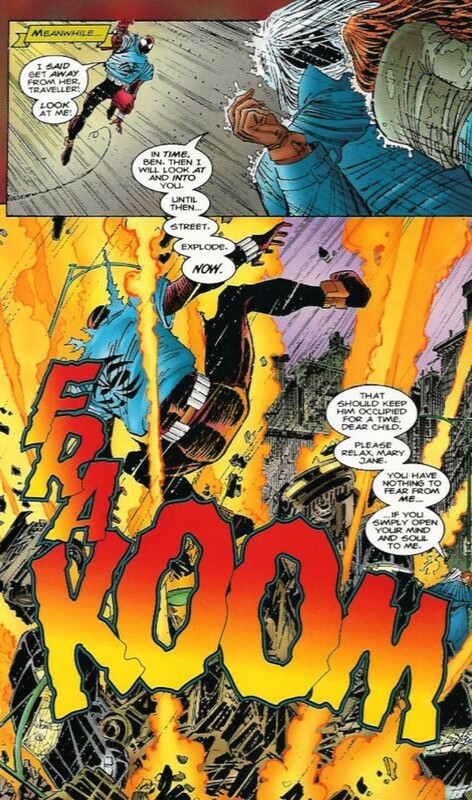 But there’s a difference between Hank Pym being set up by his arch nemesis Egghead in the classic Avengers story and Peter taking the fall for an act committed by a copy of a copy of himself – a copy of copy mind you who appears in this story and burns the infamous “mark of Kaine” into the lead detectives face in an attempt to announce his own guilt and clear Peter’s name. But no, this story MUST continue. On the plus side, Spider-Man #57 does mark the triumphant return of the new and improved John Romita Jr. to the Spider-Man universe. JRJR would fill in for Tom Lyle for an issue before returning to the book full time about seven months later, and while I’ve always been a fan of Lyle’s pencils (and his design for the Scarlet Spider), there was no better Marvel artist in the mid-90s than Romita. Even in this otherwise disappointing story, Romita brings a level of dynamism and electricity that ALMOST make up for the script. This is especially prevalent in a scene towards the end of the issue where Scarlet Spider is fighting Judas Traveller (another groan-worthy rogue from the “Clone Saga” era) in a driving rain storm while dodging falling, burning buildings (because the Traveller was magic or something). What’s funny about my love for Romita, is while I believe the evolution of his style was an added plus for the Spider-books, the sudden change in the great Sal Buscema’s pencil-work had the opposite effect. Romita managed to capture the manic energy and bombast of the 90s with his artwork while Buscema just looked like he was trying to ape that style. Certain characteristics of Buscema’s art that I had found endearing – those angular jawlines and slightly exaggerated mouths and eyes – felt even sillier by the time the “Clone Saga” was in full swing. His image of the third (or is it fourth at this point?) Peter screaming on his knees that he was the real Peter Parker looks almost ghoulish in its composition. Maybe that’s what Buscema was going for, but it fuels this idea that the “Clone Saga” is so tonally and aesthetically foreign compared to the 30-plus years of Spider-Man stories that preceded it.